As an introduction, my blended skill set includes training in studio art, neuropsychology, art education, and art therapy. Predominantly I have specialized in using art for brain injury rehabilitation and for working with students with disabilities in educational settings, as well as in psychiatric settings. These experiences have and continue to inform the directions my artwork has taken along with developments in neuroscience research, particularly brain imaging. I certainly do not claim to be a neuroscientist, although I was trained in that area during graduate school. Personally, I have been on the frontlines of brain injury rehabilitation using art to address behavioral, cognitive and other therapeutic goals. I therefore consider myself a neurobehavioralist who based on observations of individuals in clinical or educational settings infers the extent of brain damage and related deficits that need to be addressed in rehabilitation. These observations often contribute directly to the artistic subject matter I produce. Additionally, I spend a significant amount of time as an educator utilizing my Neuro-Arts Education pedagogy. Drawing on Chaos Theory, Neuro-Constructivism and Neuroesthetics I posit thoughts regarding creativity and brain function in the Neuro-Creative Arts Framework. I developed the Neuro-Creative Arts Framework (NCAF) as a conceptual model to bridge the gap between basic neuroscience research and applications to art education practices that promote creativity development. In this Educational Neuroscience conceptual model for arts education, I define creativity as the act of engaging and developing neural circuitry and brain functions that enable unique mental activations (Garner 2015; Garner & Holmes, 2012). Numerous creativity researchers have discussed the bringing of order out of chaos as a component of the creative process. Chaos theory examines the world of non-linear dynamics as a means for understanding natural phenomena, such as neuronal activity. Teaching for creative development requires student-generated solutions, tolerance of randomness, nurturing of emergent properties, and promoting of self-organizing capacities which form the basis of chaos theory’s perspective (Abraham & Gilgen, 1995). Chaos theory contributes an emphasis on a non-linear process that values the potential of errors (Combs, 1995). Embracing errors can nurture a student’s intrinsic drive to create (Bohm & Peat, 2007). Unlike many academic disciplines, which require years of training, memorization, and practice, visual arts can offer even very young students immediate access to creative processes, enabling the formation of creative neural networks from a very young age. Neuro-constructivism views brain development as sculpted by encounters with various types of problems (Westermann, Thomas, & Karmiloff-Smith, 2009). The types of problems encountered by the learner directly affect brain development. This is contrary to conceiving of the brain as containing pre-wired circuitry, or modules, which make learning possible (Fodor, 1975). Although the study of adult brains does reveal that some degree of modularity exists, these specialized areas are considered by-products of problem solving activities. Neuro-constructivists posit that brain development and organization result from problem-solving activities encountered in a given environment (Garner, 2005, 2010; Quartz & Sejnowski, 1997). “Under a neuro-constructivist model for education, the humanities and arts education become important, not only as content areas, but as contributors to brain development itself ” (Garner, 2005, p. 1299). My artistic existence typically runs between the boundaries of art and science with reverence for the phrase, the “Art of Medicine.” It is the unknown qualities of the body and particularly the brain that fascinate my curiosity. The placebo effect, the essence of consciousness and the mind that still lie beyond the bounds of scientific comprehension, leaving fertile ground for artistic analysis, interpretation, and expression. What is the brain ? The brain is the thing inside my head that allows me to talk about the brain! That is absurdly humbling and at the same time extraordinary. At a conference I attended, a well known keynote speaker stated: “Science asks small questions that have an answer. Art asks big questions that do not have an answer.” I cannot say I am in total agreement with these statements, but I do believe they hold some conceptual validity in attempting to understand the difference between the two disciplines. Art and science have always been intertwined. Long before scanning electron microscopes, photography, and brain scans there were sketches and drawings that documented the phenomena of body and brain. Leonardo da Vinci led to Golgi and Cajal seeking to precisely render elements and structures of the brain through the medium of drawing. All of us who work at this intersection are certainly indebted to Santiago Ramón y Cajal. The detailed intricate drawings he produced of neural structure are elegant, complex, and simplistic. They yield information about brain architecture that had never been seen before his time. At that time phrenology was the brain science of the day, an art that devolved into popular culture becoming a farse of sideshows and medicine men. This valued history of neuroscience should temper our scientific and artistic expressions of today. As a neuro-artist, I am informed by science but not bound by The Scientific Method. This opens doors to creative avenues that may otherwise go unexplored. 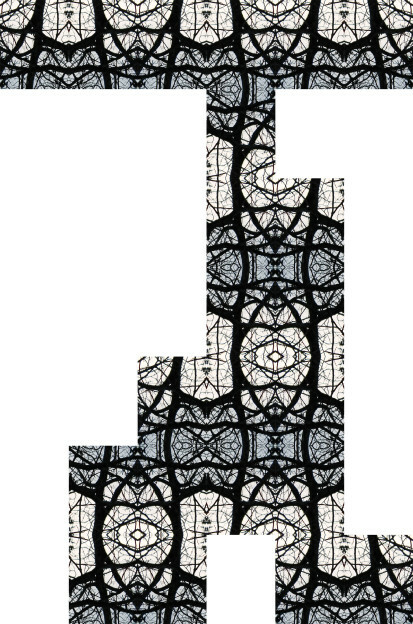 Of key importance to my current work is the interconnectedness of things (natural and man-made) containing dendritic forms. I look below my feet seeing asphalt cracked by time and weather and I see it! In a plane I look from above seeing rivers and highways with the same characteristics as the neurons in the brain. The primordial nature of these ever present forms from macroscopic to microscopic replicate themselves throughout the world we inhabit in fascinating ways. Like leaves on a tree changing color through the season of fall the images from brain scans of various sections lighting up with color become so intriguing. At the same time these images are misleading as the same brain regions can be activated by a number of tasks. I am particularly interested in the most recent research on brain circuitry and the ability of neuroscientists to stain and model the intricate relationships between neurons and dendrites. The resulting images are truly works of art. Once the colorful leaves fall from the trees their true neuronal character is exposed. 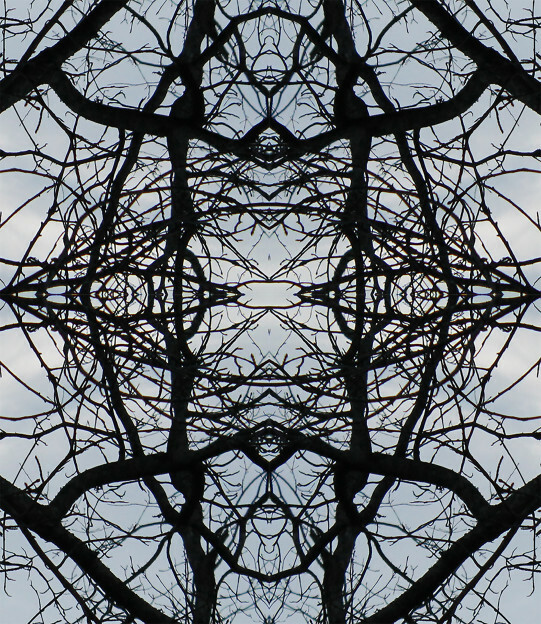 Against a cloudy, cold winter sky the limbs stretching upward easily become a macroscopic vision of the neurons existing at the microscopic level. This is an intriguing time with the explosion of neurological imagery available for public viewing. The amazing detail even down to the level of brain circuitry has been characterized aesthetically as a thing of beauty. This has brought evermore artists into the realm of neuroscience not only as spectators, but participants and collaborators in comprehending the full aesthetic and artistic potential of our bundle of neurons. In the last few years I have discovered a method for creating photomosaics which yields an aesthetic that I refer to as complex symmetry. At a distance these photomosaic installations appear as a relatively simple repeating symmetrical pattern, but as they are more closely approached an intricate collection of networks are revealed. This collection of dominant and subdominant networks is reflective of neural networks. Additionally, these mosaics relate to the brain both through their symmetry and through the complexity of networks or circuits that are created. Both electronic and neural circuitry are at the forefront of today’s world, making them important subject matter for artistic explorations. The creative process involves taking a sample from an image of bare tree limbs much like sampling the electrical activity or slices from the brain in neuroscience. These pieces are also modular in nature, not unlike Fodor’s modularity, one unit serves as the functional architecture of the aesthetic. Once assembled into an installation they take on an architectonic presence that becomes a metaphor for neural architecture and modularity. This solution was both elegant and parsimonious leading some viewers to make Rorschach like interpretations, and even to sightings of the Celtic archetype Green Man, alluding to the cognitive processing taking place in there neural nets. 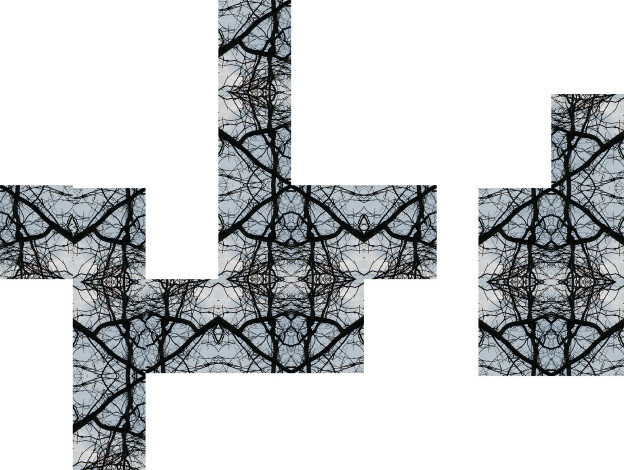 These photomosaics that incorporate the use of tree limbs which mimic the neurons of the brain are simple yet complex. From afar the encounter with these installations is that of a simple repeating symmetrical pattern akin to patterns found in the decorative arts. But as the pieces are approached more closely the viewer begins to visualize the increasing complexity of the work. This is much the same experience one has when encountering the human brain. In its whole the simplistic symmetry is obvious, but exploration beyond its simple exterior reveals an increasingly complex system of networks. The process of moving from simplicity to complexity, such as moving from a single neuron to the billions that compose the brain and yield the consciousness of mind, is fractal in nature. As a single element is repeated mysterious designs begin to emerge. I feel this creative process and the product align tightly with my journey as an artist. Early on I was interested in the clean, simple, often geometric works of the minimalist movement. My early work mimicked the sublime simplicity of minimalism (e.g. Constantin Brâncuși), but over time I sought to unite this style withthe chaotic complexity of expressionism (e.g. Jackson Pollack). I feel this has been accomplished in these recent photomosaics. This image is intended to be visually and aesthetically disruptive in the same way brain injury and degeneration (Alzheimer’s, Parkinson’s, etc.) are to an individual’s life. This disintegration interrupting the fluency and precision of neuro-circuitry creates disarrayed cognitive processes and distorts interpretation of the world itself. The beautiful complex neurological symmetry is dissolved into misfiring neurons and dying dendrites, until death. It is not intended to comfort the eye or the mind. My works tend use missing pieces symbolically to reference the human condition as experienced through the lens of neural decline. The blood brain barrier is an interesting phenomenon functioning as an interface that separates the brain and circulatory system protecting the central nervous system from toxins while maintaining a stable environment for the brain. This is a very unique and important function. Of course the color red is symbolic of blood, as is the “Circle of Willis” which is a predominant element of the imagery and is crucial in supplying blood to the brain. 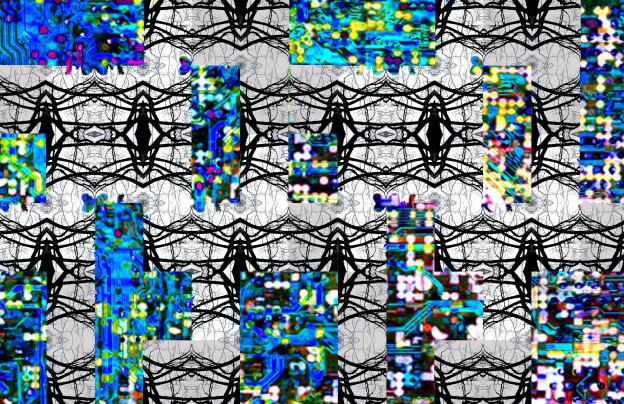 Appropriated images represent memories and networks intertwining in the neuronal environment. Again, because of my training and work in brain injury rehabilitation the artworks I produce often contain reference to brain damage, such as missing or degenerating elements. 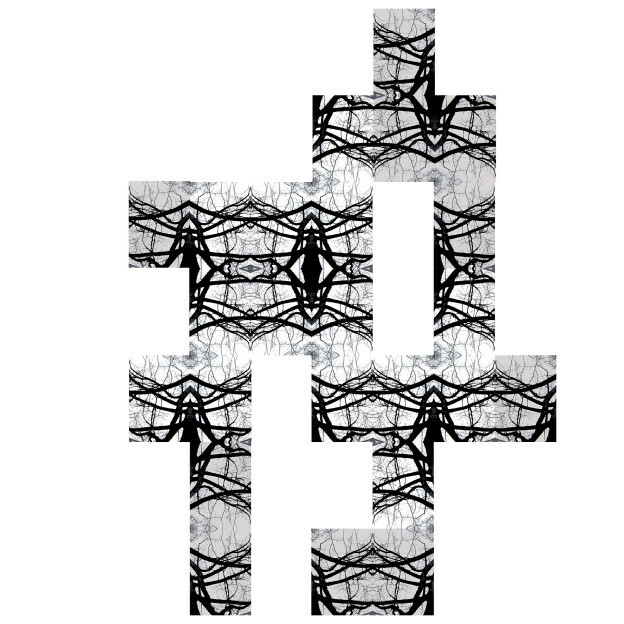 This piece is multi-layered visually, symbolically and metaphorically, with overall interpretation left to the viewer. The pure biological, physiological, and architectural components combine in a contemplation of the human condition. As mentioned earlier, both electronic and neural circuitry are at the forefront of today’s world, making them important subject matter for artistic explorations. It is also hard to deny the similarity between these two types of circuitry. It is not uncommon to encounter models of cognitive processing that use the same concepts that are used in electronic circuits, such as serial and parallel processing. It is these electronic circuits which mimic the brain that have led to the technological creation of virtual worlds. These worlds are metaphors for the acts of imagination and the dreams that take place in the mind where imagery exist within a medium of their own. Another area of my interest that intersects neuroscience is that of virtual worlds. Virtual worlds that have been developed over the past two decades have grown in sophistication and potential to help us understand the brain and the disorders of the human mind (depression, PTSD, schizophrenia, etc.). For example, Brigadoon is an island in Second Life for people on the autism spectrum. The University of California Davis, Virtual Hallucinations clinic in Second Life was created to depict the inner psychological state of a person suffering from schizophrenia. A mental health research team from the University of California created the virtual world by basing, both the auditory and visual hallucinations, on interviews with two specific patients suffering from schizophrenia. Another schizophrenia related use of virtual environments is Avatar Therapy for taming the tormenting voices a patient was being persecuted by. Creating an avatar to represent the persecutor enabled the patient to encounter a seemingly physical character and become desensitized through interactions with the avatar character. There is also the National Center for Telehealth & Technology’s Virtual PTSD Experience which is an immersive, interactive learning experience designed to educate visitors about combat-related post-traumatic stress disorder (PTSD). At the University of Washington Seattle, the U.W. Harborview Burn Center created the SnowWorld virtual world to help burn victims manage their pain during bandage changes and wound cleaning. Pain research using fMRI brain scans showed significant reductions in pain-related brain activity during SnowWorld in healthy volunteers getting thermal pain stimulations. The electronic circuitry that creates these virtual worlds emulates the circuitry of the brain. These are examples of using electronic circuitry to create a virtual environment that can mediate the virtual environment created by the neural circuitry in our heads. The piece, “Virtually yours,” reflects on the use of virtual worlds and its title takes off on the old phrase with which so many hand written letters have been signed, “Sincerely yours.” It is a contemplation of what it means to be virtual and to interact via avatars. 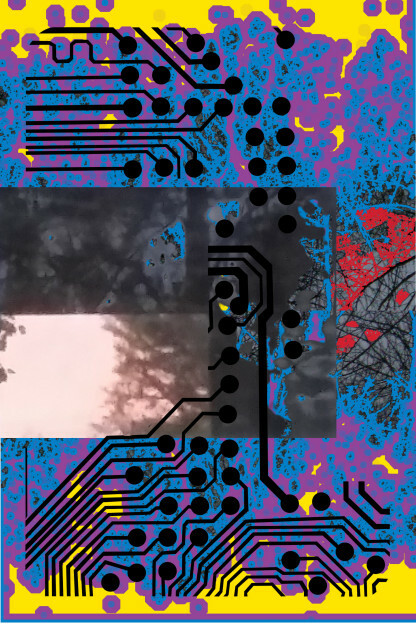 The neuronal tree limbs are now combined with electronic circuitry. When you consider that everything in a virtual world is created by someone, everything in it could be considered art and interacting with the world could be considered performance. Well that is a summary of my artistic journey to date. 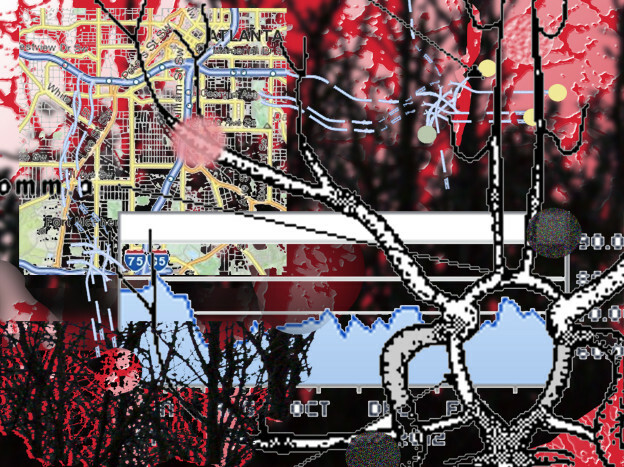 As the journey continues I anticipate further explorations of dendritic forms and virtual worlds. Both brain science and technological developments are sure to influence my creative process and products in the future. Abraham, F. D., & Gilgen, A. R. (1995). Chaos theory in psychology. Westport, CT: Praeger. Bohm, D., & Peat, F. D. (2007). Science, order, and creativity. New York, NY: Routledge. Combs, A. (1995). Psychology, chaos, and the process nature of consciousness. In F. D. Abraham & A. R. Gilgen (Eds. ), Chaos theory in psychology (pp. 129-137). Westport, CT: Praeger. Fodor, J. (1975). The language of thought. New York, NY: Crowell. Garner, R. (2005). Neuro-constructivist model for education in the humanities. International Journal of the Humanities. 2, 1295-1300. Garner, R., & Holmes, D. (2012). The principles of neuro-arts education. The International Journal of the Humanities, 9(10), 1-10. Garner, R. (2015). A conceptual model for neuro-creativity in visual arts. In E. Zimmerman, & F. Bastos (Eds. 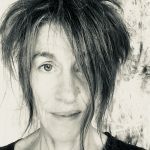 ), Connecting creativity research and practice in art education: Foundations, pedagogies, and contemporary issues. Reston, Virginia: National Art Education Association. Quartz, S., & Sejnowski, T. J. (1997). The neural basis of cognitive development: A constructivist manifesto. Behavioral & Brain Sciences, 20(4), 537-596. ← Communicating the complexities of chronic illness through art.